Airman Donald Farrell is sealed in a cramped steel chamber at the School of Aviation Medicine, Randolph AFB, to simulate a space flight. The air pressure is half of what it is at sea level and Airman Farrell cannot stand up nor lie down. His test lasts for seven days. 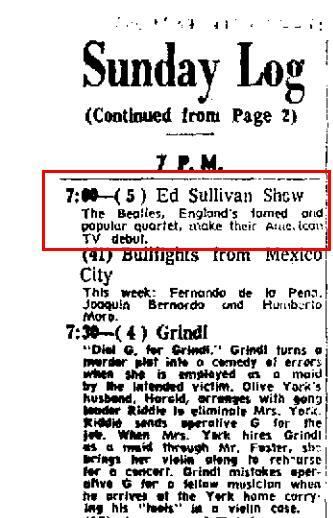 The Beatles make their American television debut on the Ed Sullivan Show, broadcast on KENS Channel 5 at 7:00 p.m (right). 45.3% of U.S. TV households tune in, representing 73 million people — a record for an entertainment program up to that time. Tom Wopat from TV’s “Dukes of Hazzard” performs with Michael Martin Murphey at the San Antonio Stock Show and Rodeo.